Each year, on the 31st January, every Group in the UK is required to complete an annual census of its membership. Amongst other things the census return is used to calculate how much CAPITATION each Group has to pay. Capitation is a fee each year that our Group has to pay to the Scout Association for every member of the group (Beaver, Cub, Scout & Leader). It equates to approximately 1/3rd of the subscription that we receive from parents (subs). This is to cover insurance and the running of the National Scout Association. A portion of the money also goes towards the running of Crawley District Scouting and West Sussex County Scouting. A number of Groups require parents to pay this amount in addition to weekly subs. At 7th this has never had to be the case due to the good management of the funds of the Group by our Group Executive. 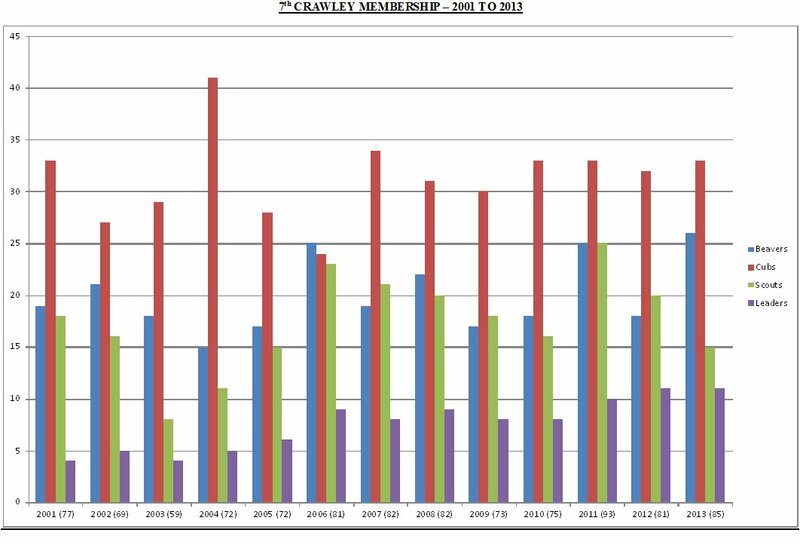 Below is a graph showing the total membership for the 7th Crawley Group from 2001 to 2013 taken from the Census figures in January of each year.